Bend Tooling is an industry leader in tube bending tools for mandrel bending. We consulted with their management and staff to re-design the website to create a modern, professional and mobile optimized website to serve as an information hub and lead generation tool. We implemented a free white paper download that is well-read in the industry. It was downloaded over 1,000 times just in the first month. We tailored the tooling quote form to allow clients to enter exact tooling specifications to speed up the quotation process and save the sales staff time. As the author of the Bend Tooling Encyclopedia™, the industry’s only comprehensive resource for the terminology used in rotary-draw tube-bending, we designed a visually appealing and easy way to navigate this huge resource. With their global reach, they required parts of the website to be available in Spanish and Portugese. Using sub-domains, we launched two additional translated versions of the site. This more technical project was topped off with a custom java-script Mandrel Nose Placement Calculator that is one of there most wildly used tools. 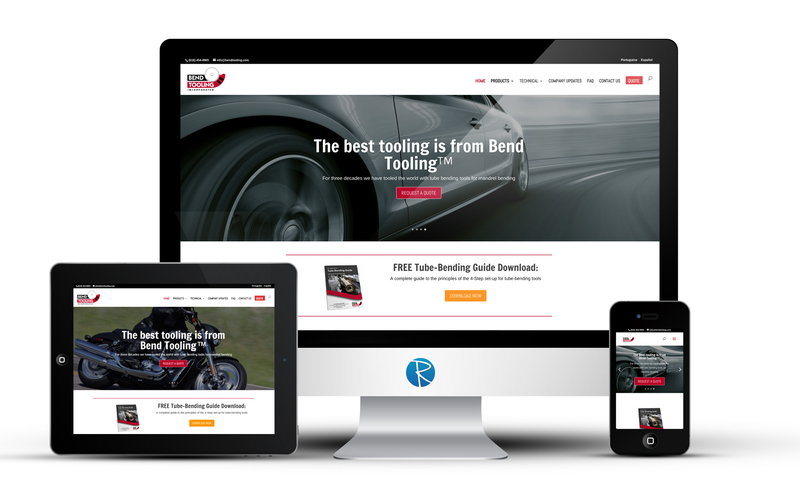 With updated images and a clean design, Bend Tooling is looking like the leader they were meant to be.